Just a note to acknowledge the lack of blog updates recently. From February to the end of June I spent nearly every day researching and writing about the Swans for my upcoming book, Swansea City's Greatest Games, so this summer I've taken a bit of a break. I mean, I am usually pretty lazy over the summer anyway, but at least this year I have a bit more of an excuse... (do I?). Rest assured, as the new season dawns there will be more fresh content from myself and the contributors (who also seem to have taken a bit of a summer break). Meanwhile, as soon as the book is available for pre-ordering I will write a big article about what's in it and what you can expect. It's looking good though! Anyway, that's it for now, keep checking back and see you soon! "Good goal Messi son - done exactly what I taught you." Swansea City: "Paella and chips please mate"
"Un San Miguel por favor Pedro." Like the majority of British holidaymakers, I only really know one or two Spanish phrases. And - with most of Swansea City's Spanish contingent making a moody exit this summer - it's probably for the best that I didn't make the effort to learn much more. Joking aside, it is looking more and more likely that when the 2014/15 season arrives we will probably not see the likes of Alejandro Pozuelo, Jose Canas, Pablo Hernandez and Michu at the Liberty Stadium. Rewind to 19 September 2013, when Swansea demolished Valencia in the Mestalla. 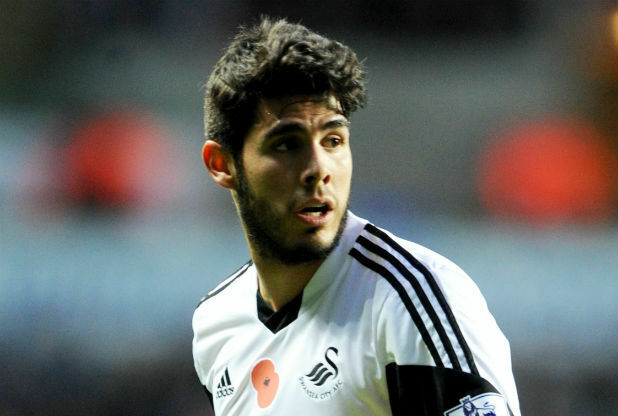 The Swans fielded a starting eleven featuring six Spanish players - more than their hosts! But, once the heart of the team, time seems to be up for the Spaniards. Towards the end of the season, after Michael Laudrup's departure, there appeared to be a rift forming between the Spaniards and the rest of the team (Angel Rangel excluded perhaps). We heard of no less than two separate training ground bust-ups, including the notorious #Brickgate incident in April 2014. But on the field the Spaniards did have some brilliant moments in the spotlight. Against QPR in 2012, Chico was described by the Daily Mail as 'composure and comfort on the ball personified', while Michu was the poster boy for Swansea's centenary season - and rightly so after his 22 goals and the incredible passion he showed for his new club. Alejando Pozuelo - on his way out. The others showed potential at times. Hernandez had moments of genius - look at his blistering performance against West Brom in 2012. He was like a player possessed. It's just a shame he couldn't keep those intense periods of wonder football at a consistent level. Chico too had his moments, but they were watched tentatively, knowing he was only ever a few minutes away from doing something ridiculous. Meanwhile, Pozuelo - while raw - showed glimmers of what he may be capable of in the future and Canas tried to emulate the Leon Britton pit-bull role in the centre, though was nowhere near as composed as he should have been. In all - as I've suggested - consistency and the lack of it was the problem. For every one game of brilliance and excitement, there were two or three of confusion and boredom. Naturally it was not just the Spanish players at fault, but their attitudes didn't seem to help. We'll never fully know what goes on behind closed training ground doors, but it is clear that the majority of the Spaniards are not part of Garry Monk's 'get back to basics' plans. Monk has hinted he wants to keep hold of Michu - who has been tipped to go to Napoli or even West Ham - but the midfielder just doesn't look like he wants to stay with the Swans. Hernandez, meanhwhile, has been linked with Qatari outfit Lekhwiya SC (no coincidence that a certain Michael Laudrup has recently taken over there). Whatever happens these Spanish players need to be replaced if they do go, otherwise the squad will be left looking a little bare. It's unrealistic to say 'let's just use homegrown talent' or 'let's not have any more Spanish players' because - as we all know - the Spaniards have generally been crucial in Swansea's rise and establishment in the Premier League. But maybe next time the club should go for quality over quantity. 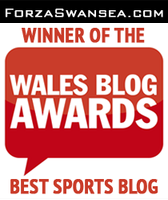 Swansea City: A Midsummer Night's Update! Firstly, I'm very sorry for the relative silence on the blog. This is partly down to it being the summer and not having loads of material to write about, while I've also spent so much of my time finishing off my new book, Swansea City's Greatest Games (more details on this in the coming week or so)! But for now, let's have a brief catch-up! Garry Monk and Huw Jenkins have been uncharacteristically busy in the transfer market this summer and have accrued four new players already, paying next to nothing for some top talent (nothing new there then!). Marvin Emnes has also joined the club for the third time - this time a permanent fixture! He wasn't free (although we don't know the price) but we don't mind splashing out a little on an attacker who knows the club and can score/create enough from the bench to make it worthwhile. Then comes the signing of young left-back Stephen Kingsley from Falkirk (another undisclosed fee... if they don't want to tell us let's assume it was £35million!). The 19-year-old is probably another one for the future, but may make more of an impact if Ben Davies does leave. 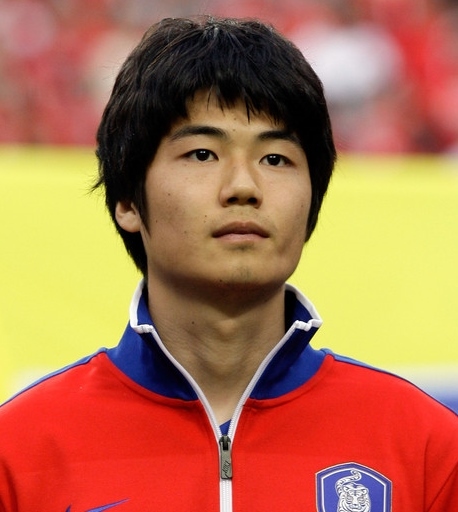 Ki Sung-Yeung and his South Korean team-mates were pelted with toffees thrown by angry fans when they arrived back home after their disappointing World Cup group stage exit (the video of this incident is here). Harsh on Ki, who actually played some brilliant football throughout his games. Wilfried Bony, meanwhile is also back home following Ivory Coast's failure to make it out of the group stages. Bony scored two goals, but their early exit from the tournament means my bet on 'Bony to be top Premier League goalscorer' at 50/1 was essentially spoiled there and then! Gutted. From a Swansea perspective both Jonathan de Guzman and Michel Vorm are still in the cup with Holland, who face Costa Rica in the quarter-final on Saturday at 9pm. I expect de Guzman to feature again in the tournament, especially with Nigel de Jong ruled out, but seeing Vorm may be limited to quick flashes of him on the bench. 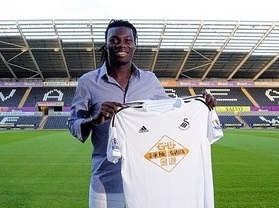 Swansea are back in training which means the new season is just around the corner! Not before the team head off to America first for a series of friendlies. On Wednesday, 16 July they'll take on Mexican Lega MX side Chivas Guadalajara, then will travel north to face Minnesota United (North American Soccer League) on Saturday, 19 July.